SB 998 as amended would change the law on bicyclists at stop signs. Sen. Floyd Prozanski, D-Eugene, amended a bill that was pending before the Senate Judiciary Committee, which he heads. The amended version of SB 998 provides that cyclists may treat stop signs or red flashing lights as if they were “yield” signs. This is known as an Idaho stop because that’s where it became legal years ago. On April 9, the committee voted 6-1 to support the bill and send it to the floor of the Senate. Sen. Sara Gelser, D-Corvallis, was among the supporters. Cliff Bentz, R-Ontario, was the only no vote. As of Thursday, the floor vote had not been scheduled. If the Senate approves, the bill moves to the House. 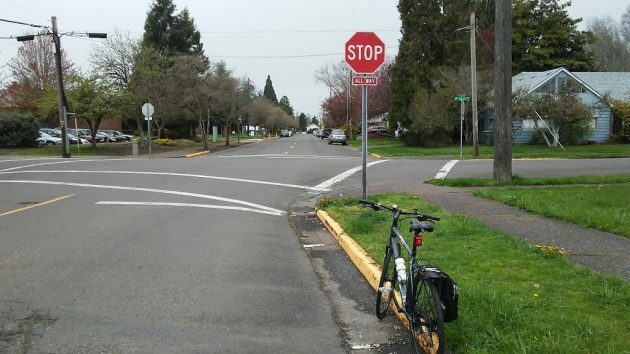 Under current Oregon law, bicyclists are treated like other vehicles and must stop at intersections controlled by stop signs or flashing red lights. Some other states including Idaho allow cyclists to proceed without stopping if they have the right of way. Here’s why cyclists don’t routinely come to a complete stop at intersections when there’s no cross traffic: If they’re cleated in to the pedals, they’d fall over, unless they are skilled enough to perform a track stand. They could uncleat, get off the saddle and put a foot down, and if there’s any cross traffic that’s what they do. But if there’s no traffic, why go to all that time-consuming trouble and lose any forward momentum they had? In California this was called the “California stop,” not for bicycles but for cars. It’s a good idea, saves time and a bit of gas, and one feels less foolish for having to come to a complete stop when it’s quite safe to go ahead and make a turn (right-turn only). Not actually legal as far as I know, but usually ignored by any lurking police officer. The problem is, most people don’t do the “yield treatment” correctly. For an example, take a look at the intersection of Gibson Hill and Scenic in N Albany. Very few people either realize or care or both that the sign saying “Right turn permitted…” turns the Stop into a Yield that allows them to proceed if it’s clear. In the 9 years I’ve been going through that intersection, from Scenic proceeding North, I’ve been properly yielded two less than a dozen times. Drivers, including bicycle drivers, can’t be trusted to interpret Yield or Safely or any other strictly undefined status. But, hey, as long as I’m criminally and civilly cleared if I run over an idiot who crosses in front of me, I’m OK with it. Is there some authority you can cite for not treating the stop on Scenic northbound at Gibson Hill as a regular stop sign? Big supporter of the “Idaho stop.” It’s dumb to treat bicycles like cars. On a related note, I got pulled over not long ago for rolling my bike through a stop sign in Corvallis by an officer — who was in a car — named Lance Armstrong. He gave me his business card while letting me off with a warning. But if there’s no traffic, why go to all that time-consuming trouble and lose any forward momentum they (cyclists) had? But if there’s no traffic, why go to all that time-consuming trouble and lose any forward momentum they (motorists) had? Right of way would mean the bicyclist coming upon the 4 way intersection prior to any cross traffic would by default have the right of way. However this puts the bicyclist in danger with a 1-2 ton vehicle if the driver of the vehicle is not slowing or stopping prior to the intersection as well. This would have more to do with the night owl rule meaning pedestrians and bicyclists cross intersections freely when no operating vehicles are within the area being occupied. That also reminds me of vehicles at intersections during snow snowstorms and icy situations. What I find interesting is I have witnessed a semi truck driver carrying the U.S. postal mail leaving from the post office in Downtown Albany, Oregon that drives through stop signs in the late hours of the night which just goes to show the larger vehicle has the right of way and reason says if there is a train coming step out of the way. I like the put one foot on the white line and continue rule when safe to do so. This is a big mistake! It is only going to increase incidents of motor vehicle-bicycle and/or pedestrian-bicycle accidents. Why not make it also legal for bicycle riders to ride their bikes in the pedestrian cross walk. They are only pedestrians when they are off or walking their bike. Making things easier does NOT make life safer. Has it increased accident rates in Idaho? Allow bicyclists more….!!! From my years driving in Albany..few if any bicyclists obey the traffic laws as they are. O.K., save for our law abiding blog manager. The rest…just do as they please. Yes, at least Corvallis tries to keep a lid on it especially around the college. So with the Idaho law in effect…my car approaches on a thru street. Bicyclist on a stop street. “He” fails to stop owing to a misperception of distance & I smack him! Too bad for me as he’d have the “law” on his side….NONSENSE!!! Bicyclists need to keep to the sidewalk!! I pay taxes, fuel taxes, license fees & insurance for the right of way on a street! The cyclist would have to yield if you have the right of way. There would be no difference in the case you cite. There is absolutely no way the law could have been responsible for any decrease in accident rates. There’s got to be another explanation. Albany cannot make up its mind as to whether or not we should assist hundreds of people without homes and yet here we are with everyone from State legislators to local pundits wasting time passing rules about bicycles or wasting time talking about those changes. It’s no wonder the nation is in turmoil. Between the Idaho Stop and the Space Force, a lot of what passes for important is totally unimportant. Rome is burning, folks. Move on from the bicycle rule. My observations of a number of years driving, and bike riding, is that bicyclists tend to disregard the fact that, according to Oregon Law, they are supposed to obey the traffic laws – exactly the same as a motor vehicle. Points in fact, disobeying signs, riding the wrong way on one way streets, riding on the wrong side (going against traffic), riding on sidewalks, riding two and three abreast on rural roadways, etc, etc. Until such time that it can be proven to me that bicyclists are responsible enough to obey the laws we leave it as is. No offense meant to those bike riders who obey they laws. Those who do should take it upon themselves to remind their peers that the actions of some affect the reputation of all. I tend to notice that motorists disregard traffic laws at a similar rate to cyclists. Anecdotally it seems to me like the drivers with the most disdain for bikers are the ones that speed and roll stop signs the most. Well at least we have a forum to express our views. Wish he’d (H.H.) stayed on as Editor…we may not have the Albany-Democrat-Herald-Gazette-Free-Press that we have now. I give more than a measure of distance for bicyclists on the roadway regardless of my comments here! If this is enacted then why not include those who ride motorcycles. The also have to place one foot on the ground when stopping. I know the rebuttal is that they don’t have to take their foot out of the stirrup, but, the reason? is the same, they won”t have to stop. The rules of the road for bicyclists are the same as cars because kids ride bikes most. Bicycles are a child’s first experience learning the rules of the road. Kids graduate to automobiles soon enough. It’s better to keep the rules the same to promote lifelong safety on the road. The clips are the road hazard. Right, it’s inconvenient. But mainly it’s unnecessary when there is no traffic. It’s kind of like the 20 mph school zones when there are no children anywhere in sight. What these kinds of ticket-giving occasions engender is not safety but contempt for petty restrictions and laws.